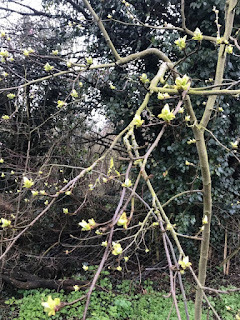 I am fairly sure it is only a couple of weeks since I last wrote a Tree Following post, yet March itself felt a long month. We have had lots of cold, frost, snow and rain. Rain, did I mention rain? More rain and more cold days than has felt reasonable. Yet despite all this, the quince trees have carried on regardless. Quince Major is peppered with green growth. The signs of blossom forming are clear, it will not be too long before it arrives all being well. 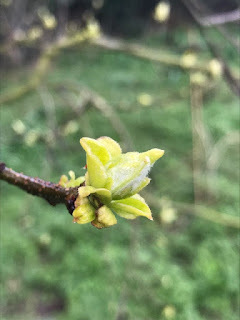 Quince Minor, who last year failed to blossom due to a late frost, it also developing well. I am really hoping we do not get late frost this year. Last year's frosts damaged a lot of plants just at that vital moment when they were stepping up into growth. It would be nice to think that as we have had a cold frosty start to spring that we are done with the frosty weather. Yes, I know, this is probably a silly hope. I often look back to this time last year when I am writing these tree following posts. As mentioned above this spring has so far been very cold and grey and I knew that a lot of things were behind where they were last year. This is Quince Minor this time last year. This is Quince Major. The difference in growth is dramatic. Last year things felt early, this year they feel late, which always makes me wonder if there is ever a year that feels just right? The plus side of the lateness is that if there is that late frost maybe the blossom will be more protected from it. 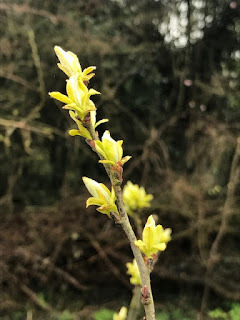 I’m assuming ‘minor’ and ‘major’ refer to two quinces of differing sizes in your garden, but I’ve learnt since I’ve been blogging, that there are many plants I’ve never heard of before in the UK. 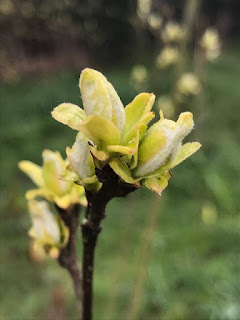 The quinces have lovely pale green buds on them. I’ve also read your garden awards (from last year) which I thought was a clever idea I wish I’d thought of myself. Thanks :) yes I started with only one quince tree that refused to fruit, so I have added another to give it some competition. Spring feels late here in the southern USA, too. We had frost over the weekend. Hope it was the last one. And I hope your Quinces do well for you this year! Spring is really late this year. At least where I live, and apparently also where you and the quinces live. But at least here it seems to be speeding up lately. And it is fascinating to see this time last year - I had thought spring was late but this proves it. Very nippy here today, but they forecast temperatures of 20C next week!